CSS (Cascading Style Sheets) is a language that controls the look and feel of html elements in browser. Layman example:- Going to beauty salon for hair cut is applying CSS on our face (which is equivalent to HTML). What is the meaning of CSS selector? 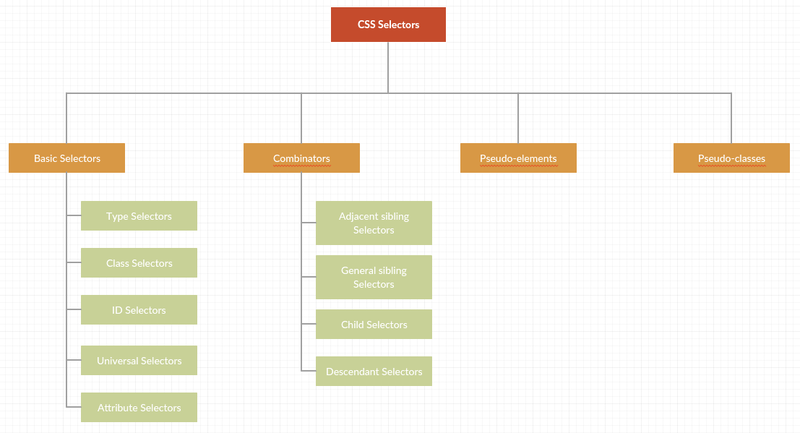 Selectors are used to apply CSS styles on html elements. There is an extensive list of CSS selectors available, allowing for close grained precision when targeting elements to style. Layman example:- there are numerous types of hair cuts(styles) and various tools to cut hair (CSS selectors). How many types of Selectors? Basic/Simple selectors: Match one or more elements based on element type, class, id or attribute/attribute values. Combinations or Group Selectors: These are not exactly selectors themselves, but ways of combining two or more selectors in useful ways for very specific selections. So for example, you could select only paragraphs that are direct descendants of divs, or paragraphs that come directly after headings. Multiple selectors: Again, these are not separate selectors; the idea is that you can put multiple selectors on the same CSS rule, separated by commas, to apply a single set of definitions to all the elements selected by those selectors. We will be covering all these selectors in detail in the upcoming posts. Verify Regex in Robot Framework?